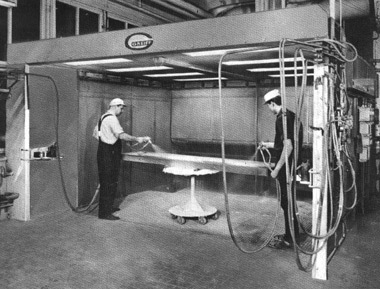 Greiff designs and develops devices for industrial painting that satisfy the high demands stipulated by Swedish and European legislation. Our capabilities and experience mean we’re able to offer services in heat recovery and other system technologies, which in turn gives our customers environmental and financial gains. We also offer training, consultancy, project planning, etc. We hold all of the certificates required by Swedish- and EU-law. Greiff Industrimiljö AB has its head office in Motala. Our highly trained engineers, who design and develop production systems for industrial painting, are located in Motala. Our factory — where numerous operations take place, including the manufacture of our devices — is also located at Motala. Today, Greiff is Sweden’s leading supplier of painting systems for both wet and powder paint. Greiff was established in Norway in 1922, and within a few years the headquarters were transferred to Stockholm. During the 1960s and 1970s, manufacturing was relocated to Vadstena, followed by the offices. Business expanded dramatically. In the early 1990s it was decided to purchase a new property, and in 1992 the operations were relocated to Motala. The modern premises house the Development, Administration and Manufacturing departments under one roof. Greiff has been part of D3 Holding AB since 2004. SCS Finishing in Jönköping was acquired in 2008. 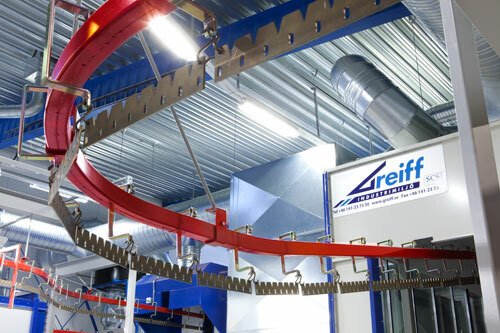 Greiff also sells filters adapted to the needs of our customers and available in several different qualities with unique properties. Greiff has a long experience and a wealth of knowledge, through which we can offer no-obligation advice, pilot studies and project planning for both manual and fully automated systems as well as filters and spare parts. Greiff holds certificate ISO 9001, which guarantees the highest level of quality in our company and for our products. We are proud to be our market sector's leading supplier in the Nordic countries, and we're happy to offer our services to companies in need of advanced technical solutions.